Every single fall I get in the mood for pumpkin spice recipes. I crave all things pumpkin! 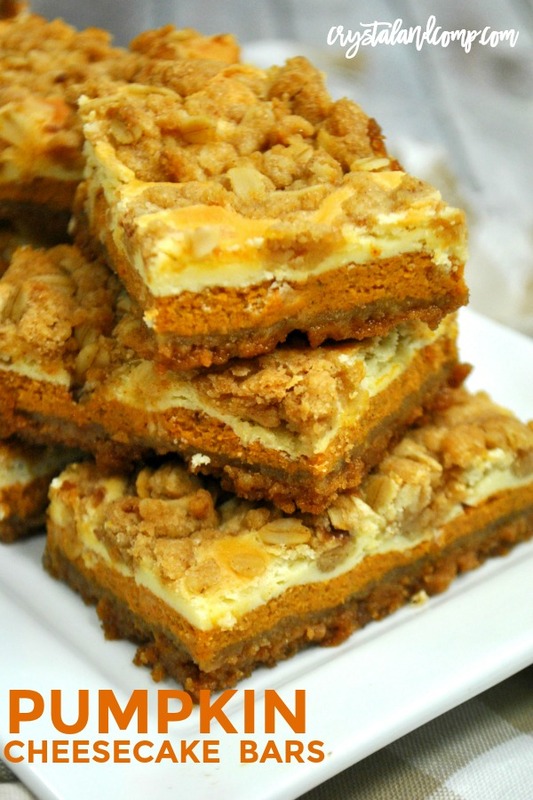 Have you ever made pumpkin cheesecake bars? They are so simple to make and feed a crowd! They are perfect for your holiday gathering, a church potluck, or just because you’re hungry for pumpkin. I love these for a weeknight dessert! Let me show you just how easy these are to make homemade! No reason to ever buy store bought again! It’s broken down into three simple sections of creating. The crust, the cheesecake middle and the delicious streusel for the top. First gather up you’re ingredients. Line your 9×9 baking dish with parchment paper. This will make removing them from the pan (and cleanup) so much easier. In a medium bowl, combine the ingredients for the crust. Mix them well until it forms a thick dough. I like to use a rubber spatula to mix this up. Once it is mixed well, press the dough evenly into the bottom of the baking pan, on top of the parchment paper. In large mixing bowl, combine the cream cheese, sugar, and vanilla. Beat well until completely smooth and creamy. I love to use my standing mixer for recipes like this. Add in the eggs, one at a time, and beat until each is combined with the cream cheese mixture. Next you want to remove 1 and 1/2 cups of the cream cheese mixture and pour it on top of the crust. Add the pumpkin puree, cinnamon, and pumpkin pie spice to the remaining cheesecake mixture and stir until completely combined. You want to be careful not to combine the two layers, pour the pumpkin layer on top of the plain cheesecake layer. Now it’s time to make the streusel. Grab a medium mixing bowl and stir together the brown sugar, flour, oats, and cinnamon. Once that is well combined, add in the room temperature butter and vanilla and mix together until well combined. Sprinkle the streusel topping evenly over the pumpkin cheesecake layer. Pop it in the oven and bake for 50-55 minutes or until the cheesecake has set. You want to let it cool for about an hour and then pop it in the fridge for at least an hour… two hours if you can. This will make it easier to slice the bars. Cut it into bars and you’re all done!